'Avalon', the Frederick W. Ayer estate designed by Parker, Thomas & Rice c. 1907 in Prides Crossing, Massachusetts. Ayer was president of the American Woolen Company, textile manufacturers. His daughter Beatrice was married to General George S. Patton. Click HERE for interior photos from the Beverly Public Library. 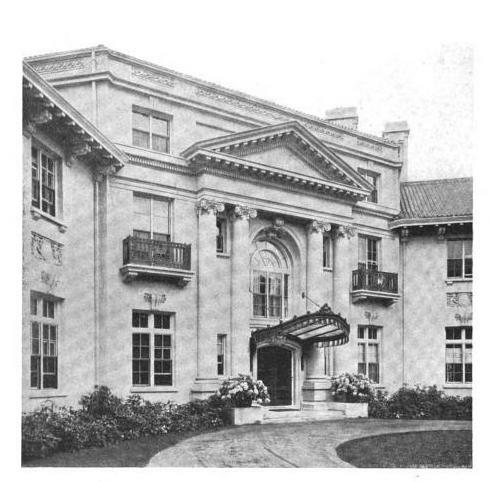 'Avalon' was demolished in 1994. 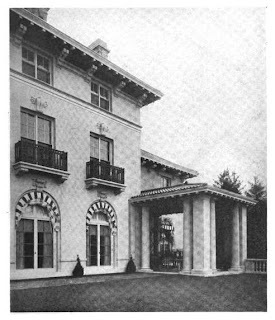 Photos from Architectural Record, 1913. The site is a neighborhood of destruction. Avalon is the curved house at lower right center. To it's immediate right is the bunker-like house built of the remains of Little Browne's marvelous Spaulding house, 'Sunset Rock', at the upper left is the site of Henry Clay Frick's bloated 'Eagle Rock', also by Little, Browne. At lower left is still standing, for now, the masterful Loring house by WR Emerson, for which extreme preservation efforts have been made. Interestingly, the Ayer and Loring families intermarried at some time. I share Ancient's sentiments all the way---Loring house is the best of the best.